You are here: Home / All blog posts / Done!! Yes, my friends, you are seeing what you think you see.Â 13.75 yards of fabric woven at 60 ppi, cut off and ready to roll off the cloth beam.Â Hooray!! 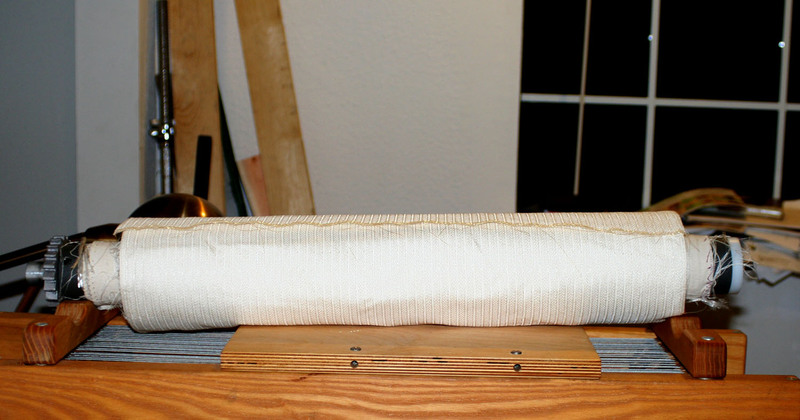 I actually cheated a bit.Â There was probably another 12″ of warp left on the beam when I stopped weaving and started sampling, but I had found a major flaw in the fabric about an inch back, and rather than unweave an entire inch (incredibly laborious), I decided to quit weaving the fabric and start sampling. I am moderately pleased with the fabric overall.Â I say “moderately” because I was having major problems with shaft #23 floating towards the end of it; I looked at it, played with it, and couldn’t figure out the problem.Â Now that the warp is off the loom, I’m going to take apart the dobby box and do some more serious troubleshooting on it – I can’t have this creating problems while I’m weaving! But anyway, it is done, and ready for me to start repairing flaws.Â This will probably take me a few days of concentrated effort, so I’m going off to purchase a needle threader today, so I can draw all the loose threads to the back of the fabric and secure them before wet-finishing.Â I am NOT looking forward to wet-finishing – even with one of those mini-presses, nearly 14 yards of delicate silk fabric (plus two more from the sample warp) is a LOT to press! Major accomplishment – and very, very good for someone who has been weaving for what – 3 years? Hey! Congratulations! That’s quite an impressive accomplishment. Go eat chocolate and celebrate!